Asha Rani, a 24-year old woman happily married with two children, lives in the Vashantek slum in Mirpur, one of the most crowded slums in Dhaka city. She lives with her husband, children, and in-laws in the same compound which is a practice in Bangladeshi family norms. Asha’s family is very loving and respectful, but when she started to raise her first child, she realized she did not know important things about how to raise a healthy child. For example, she had questions about immunization needs, nutritional diet, and common physical ailments that can be managed at house hold level. After the birth of her second child (a daughter named Debi), a health worker informed her about ‘Aponjon’, a new service that provides the type of health information she was looking for. She found out that, Aponjon is a mobile health service that provides health related information to expecting and new mothers, and also their gate-keepers e.g. husbands, parents and parent-in-laws. This service provides pre-programed voicemail and text messages on health and safe motherhood to encourage the adoption of best practices during pregnancy and delivery. After getting acquainted with Aponjon, Asha is now an excited registered user of the service. After registering with the ‘Aponjon’ service, Asha is now well informed about the immunization schedule for her daughter, and got motivated to take her to the health facility for vaccination. The ‘Aponjon’ service has made her knowledgeable on supplementary food choices for her child after her daughter had 6 months of exclusive breast feeding. Now, even her mother-law is unable influence her to feed her baby cow milk. Asha, particularly likes the Aponjon message where, mothers are advised to make direct eye contact while interacting with the baby. Accordingly, Asha maintains eye contacts while talking to her baby. She believes it is helpful in developing bond between her baby and the mother. She also talks with her baby with a clear accent so that the baby learns to speak in a clear accent she grows up. Asha and her husband share the same phone. 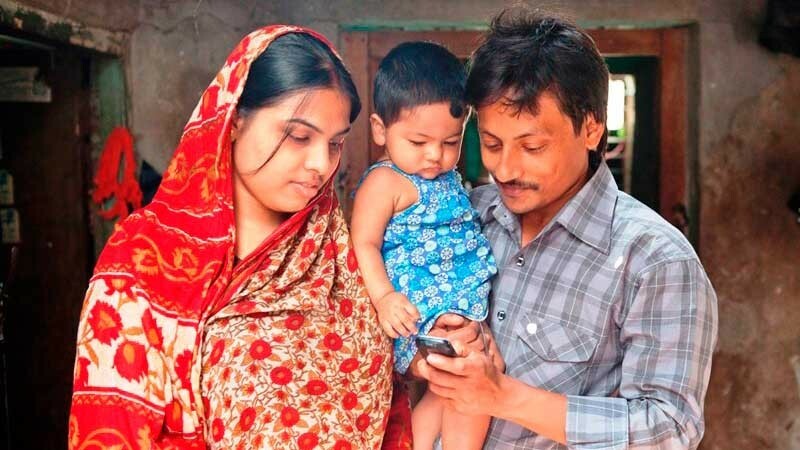 Every week her husband receives SMS text messages on his mobile phone - two for his wife and one for himself. When he returns home at night, he reads the messages to Asha from his mobile phone. Ash’s husband is now much knowledgeable about their baby’s health. He is now more aware about the child’s nutrition, immunization schedule and actively learns from the messages. Asha is a very satisfied user of Aponjon. She not only uses it, but she also encourages others in her community to register to this service and she feels it is her responsibility to inform others about this helpful service. Aponjon is created under the umbrella of Mobile Alliance for Maternal Action (MAMA). In Bangladesh, it is implemented and coordinated by D.Net. MAMA is just one activity that the U.S. Government, through USAID, has supported. In total, USAID has provided more than $5.8 billion in development assistance since Bangladesh’s independence, including over $770 million invested in health outcomes. As part of President Obama’s Global Health Initiative, USAID in 2011 provided more than $61 million to support health programs in Bangladesh in the areas of maternal and child health, voluntary family planning, nutrition, and to combat tuberculosis and HIV/AIDS. USAID currently dedicates about $180 million every year to improve the lives of people in Bangladesh; promote democratic institutions and practices; expand economic opportunity; improve health and education services; increase food security and support Bangladeshi efforts to mitigate the impact of natural disasters.